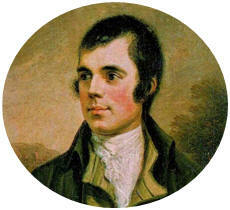 Auld Lang Syne is a Scottish poem written by Robert Burns in 1788 and set to the tune of a traditional folk song. It is well known in many English-speaking countries and is often sung to celebrate the start of the new year at the stroke of midnight at the start of New Year's Day. The song's Scots title may be translated into English literally as "old long since", or more idiomatically, "long long ago" or "days gone by". The phrase "Auld Lang Syne" is also used in similar poems by Robert Ayton (1570–1638), Allan Ramsay (1686–1757), and James Watson (1711) as well as older folk songs predating Burns.Matthew Fitt uses the phrase "In the days of auld lang syne" as the equivalent of "Once upon a time. . . " in his retelling of fairy tales in the Scots language. Robert Burns sent a copy of the original song to the Scots Musical Museum with the remark, “The following song, an old song, of the olden times, and which has never been in print, nor even in manuscript until I took it down from an old man". Some of the lyrics were indeed "collected" rather than composed by the poet; the ballad "Old Long Syne" printed in 1711 by James Watson shows considerable similarity in the first verse and the chorus to Burns' later poem. It is a fair supposition to attribute the rest of the poem to Burns himself. There is some doubt as to whether the melody used today is the same one Burns originally intended, but it is widely used both in Scotland and in the rest of the world. Singing the song on Hogmanay or New Year's Eve very quickly became a Scots custom that soon spread to other parts of the British Isles. As Scots (and other Britons) emigrated around the world, they took the song with them. Canadian band leader Guy Lombardo is often credited with popularizing the use of the song at New Year’s celebrations in America, through his annual broadcasts on radio and television, beginning in 1929. The song became his trademark. In addition to his live broadcasts, Lombardo recorded the song more than once. His first recording was in 1939. A later recording on September 29, 1947 was issued as a single by Decca Records. The tune to which "Auld Lang Syne" is now universally sung is a pentatonic Scots folk melody, probably originally a sprightly dance in a much quicker tempo. English composer William Shield seems to quote the "Auld Lang Syne" melody briefly at the end of the overture to his opera Rosina, which may be its first recorded use. The contention that Burns borrowed the melody from Shield is for various reasons highly unlikely, although they may very well both have taken it from a common source, possibly a strathspey called The Miller's Wedding or The Miller's Daughter. The problem is that tunes based on the same set of dance steps necessarily have a similar rhythm, and even a superficial resemblance in melodic shape may cause a very strong apparent similarity in the tune as a whole. For instance, Burns' poem Coming Through the Rye is sung to a tune that might also be based on the Miller's Wedding. The origin of the tune of God Save the Queen presents a very similar problem, and for just the same reason, as it is also based on a dance measure.